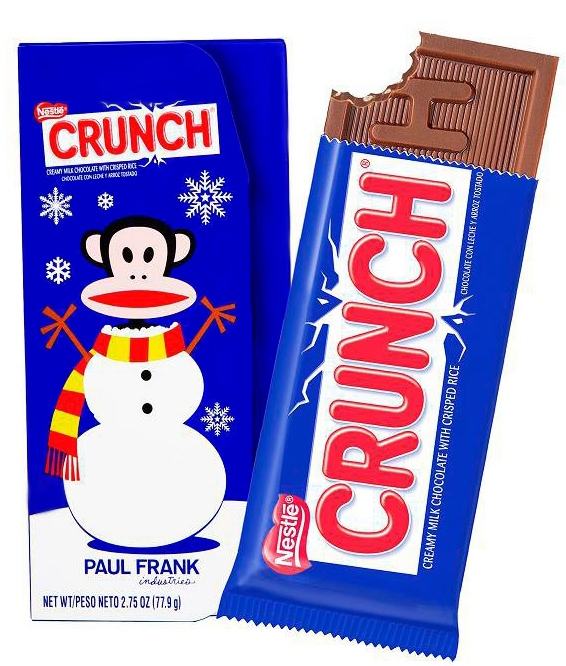 Fashion gets a sweet tooth this Christmas with a US limited edition Nestlé Crunch Paul Frank chocolate bar, available only in Target. The collaboration marks the designer’s debut in the confections retail environment. The oversized Nestlé Crunch bar tucks inside a colourful envelope that doubles as a holiday card. The unique packaging features holiday-themed artwork complete with lovable characters from the Paul Frank collection, including Julius the Monkey and Worry Bear. The piece is finished with a special note and a blank section for your own message. Nestlé Crunch and Paul Frank also have launched a sweepstake on Facebook.com/NestleCrunch with weekly drawings through the end of the year. Prizes include iPod accessories, bicycles and a $500 shopping spree to the Paul Frank store.